Mary Plehal, professional ergonomist, generously shared valuable information specific to writers. Last month, we covered correctposture and chair adjustment. Today we’ll learn how to prevent eye and wrist fatigue, proper desk organization, and monitor adjustment. Your particular needs should be verified by your health care practitioner. What I take away from today’s tips is that we must adjust our work stations to suit our bodies, and not the other way around. 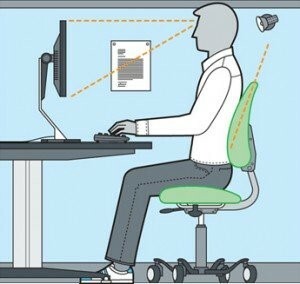 As much as is possible in your situation, make your work environment ergonomically correct. Don’t let preventable aches and pains end your writing sessions early. The better you feel physically, the longer you’ll be able to write! Colorado is a dry climate. 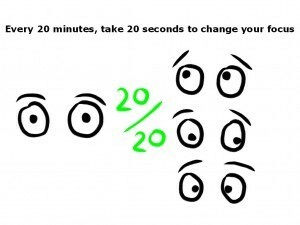 Dry eyes and eye fatigue are common. Mary’s tips will help you keep your eyes happy. 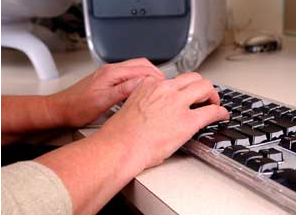 I have a tendency to stick my elbows out while typing, not unlike a chicken attempting to take flight. When I follow Mary’s next tips, I have less fatigue in my shoulders and upper back. That little critter next to your keyboard can be problematic. It’s not so much about your hand, as the position the mouse puts your wrist into, and where you place the mouse on your desk. The next section some of you won’t like. I often claim I need the clutter, and that I know where everything is if people will just leave my stacks of junk alone. I have to admit, being organized has its advantages. 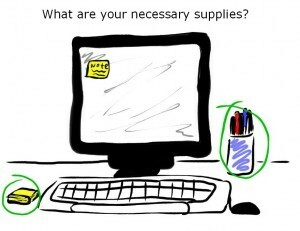 Not only does a clean and tidy desk prevent fruitless searching for misplaced items, but it also has ergonomic benefits. 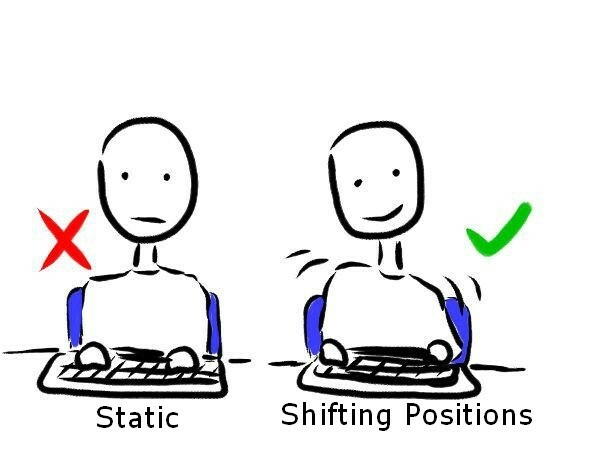 No matter what type of monitor or desk you use, you should be able to make the following adjustments to encourage proper posture. Now that you’ve gotten everything adjusted correctly, you need to cement all the settings, right? Wrong! Changing position relieves fatigue and prevents aches and pains. So you get your home work station adjusted correctly. That’s great, but what about when you work elsewhere? 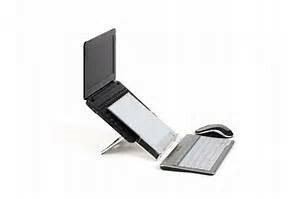 While traveling, at a coffee shop, or on a cushy chair in a sunny window? Thanks to Mary Plehal, professional ergonomist, we’ve learned about avoiding eye strain, and how to set up a work station correctly to minimize wrist fatigue. Join me next month for a continuation of the series. What happens when you do feel aches and pains? Stretching, the topic of next month’s ergonomic article, can help. 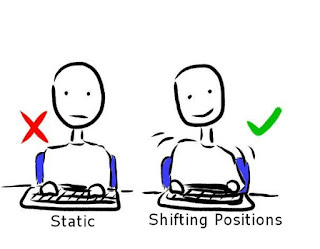 Additional thanks goes to Mary Plehal for her professional advice and illustrations for Ergonomics for Writers!